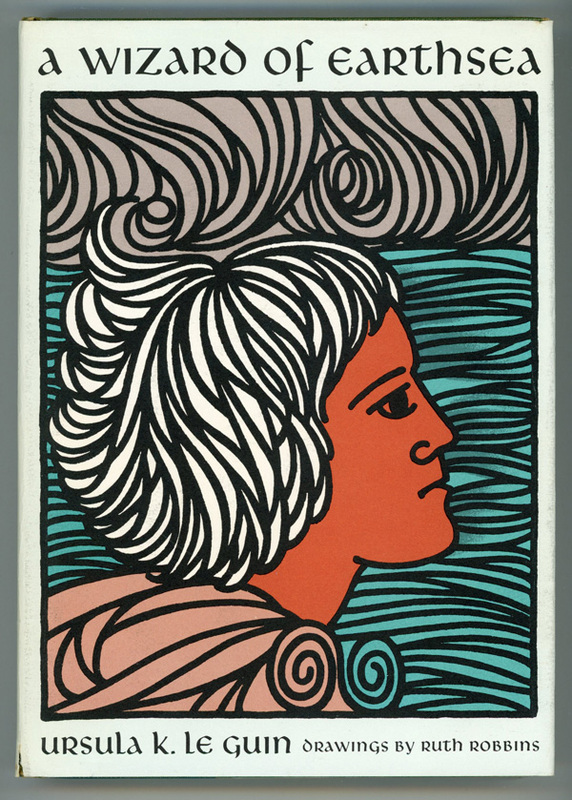 Original hardback cover of A Wizard of Earthsea by Ursula K. Le Guin, art by Ruth Robbins (click to embiggen). Of course he is accepted (though not easily). While Ged makes friends, he also develops a rivalry with another student, which eventually leads to a magical duel. Unfortunately, Ged accidentally releases a dark spirit or shadow from the realm of the dead. The spirit wreaks havoc until the Archmage (the leader of the mage’s school) manages to expel the shadow. Unfortunately the Archmage dies as a result of the battle, and the new Archmage warns Ged against both his arrogance and a possible force of evil lurking in his heart, but lets him remain at the school—in part because the shadow seems intent on killing Ged, and he is only safe from it within the confines of that island’s mystical defenses. Eventually Ged graduates and he accepts a job to protect a remote fishing community from dragons. As predicted, after he leaves the island the shadow eventually comes for him. The rest of the book chronicles Ged’s new life on the run. For a time he is aided by an old friend from the school. At another point he is shipwrecked on an island with only two inhabitants; orphans from a royal family who were dumped on the island as children as the result of a palace coup. Eventually he confronts the shadow and figures out how to neutralize its danger for good. It was a great story. And it introduced me to many concepts of magic that I adopted in my own writings and gaming scenarios. She wrote two sequels over the next few years. For a long time A Wizard of Earthsea, The Tombs of Atuan, and The Farthest Shore were collectively referred to as the Earthsea Trilogy. A few years ago Le Guin wrote a fourth novel, and has since published two collections of short stories set in the same world. There are lots of things to love about the Earthsea books. The setting on a group of islands without any continent ever being visited or even named at is interesting. The relationship between dragons and magic makes so much sense, that it seems difficult to imagine a fantasy would where it isn’t true. The cast of supporting characters is wide and interesting and easily distinguished from one another. While we’re on that subject, one of the ongoing meta issues with the stories is that Le Guin imagined her archipelago as being in a subtropic area, and is careful to describe most of the characters as dark-skinned. I think at least once she specifically likened the setting to the Caribbean. Ged is described with reddish-brown skin, his best friend from the mage school is described as black. Only the Kargish marauders are described as pale-skinned, because they come originally from a much colder climate. Some editions of the book’s cover art ignore this, and most famously when the SciFi channel butchered the story, they cast nearly every character not just white, but very white. There are so many things about this story I love. One particular bit early in the book, when Ogion is trying to teach Ged about the balance of nature and magic: Le Guin describes that because Gont is an island on which many, many people have innate magic talent and thus every village has at least one witch or magician, that rain clouds are constantly bounced this way and that, as each magic user tries to keep it from raining at their location during times inconvenient to them. Ogion refused to do that, even insisting on one hike that they sleep in the rain. Because rain is necessary for crops, the forest, and life itself. One shouldn’t use magic just to avoid a little inconvenience and without regard to the consequences. I also love the supporting character of the Master Doorkeeper at the mage’s school. He was just a person that I wish I knew in real life. I don’t want to spoil the ending for anyone who hasn’t read it, but the fact that the resolution to Ged’s problem with the shadow being that is trying to destroy him (possessing people near Ged and either directly trying to kill him or just mislead him into danger a few times, for instance), is for Ged to accept that he—like everyone—has some darkness in his soul. He has to not just acknowledge but embrace all the parts of himself, his regrets and shames as well as his victors and proud moments, in order to become the person who can stop the shadow from hurting anyone. She did not mean it as a metaphor for a queer person accepting themselves, she meant it as a statement about growing up and become comfortable in one’s skin. But for me, learning to accept myself as part of my own coming out process was a big hurdle that Ged in this book (and the sequels) helped me with immensely. And they’re great books that tell rattling good yarns at the same time!